Damon Lord: Advent calendar 2013: day 2 "Consumption"
Advent calendar 2013: day 2 "Consumption"
Today's opus behind the advent calendar door (actually there isn't a door, just this webpage, but hey ho...) is the tale "Consumption" by Marivi Soliven Blanco. 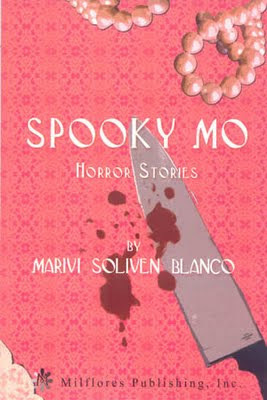 It's one of nine stories published in Spooky Mo: Horror Stories by Milflores Publishing, Inc. in the Philippines. It's a short tale on the theme of greed, but rather apt for this time of year, as it's a nicely dark original take on consumption, set in a shopping mall at Christmas in Makati, the main business district of Manila. It might be a bit difficult to get hold of, but it's worth reading. Click here to go to the publisher's site. You can also obtain it on Kindle here (Amazon UK link).